Bryson Olson (No. 27) takes off from the start line at the International Jet Sport Boat Association Blowison World Finals at Lake Havasu on Saturday, Oct. 7. At the start line of the biggest Jet Ski race in the world — the International Jet Sport Boating Association (IJSBA) Blowison World Finals — Bryson Olson, of Truckee, eyes the starting band in front of him, waiting for it to snap and signal the start of 12 chaotic minutes of racing on vintage Jet Skis. 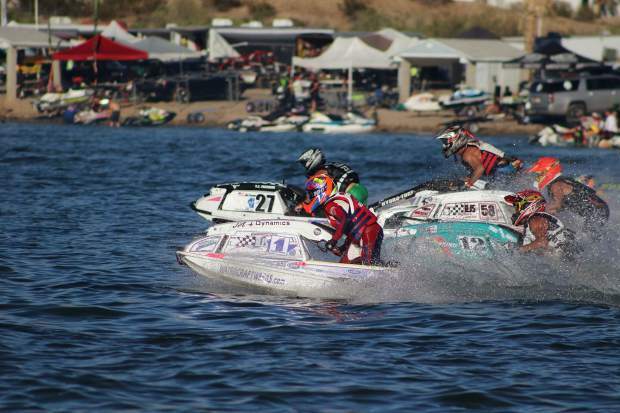 Olson, 22, started racing Jet Skis only six months prior to the world finals, with his first event taking place in early June at the JetJam Jet Ski Racing Tour on Sparks Marina. He did so well in his first race in the vintage Jet Ski class, with a close finish behind the winner and world champion Michael Prodanovich, that he decided to go all in on the sport. Olson’s motocross background is a big part of his success on a Jet Ski. He began riding dirt bikes when he was 6 years old. He then later became fixated with snow skiing, and spent most of his teen years on the slopes or racing on a motocross track. Then his father found a pair of old Jet Skis online, and bought them to toy around with on the water. The vintage Jet Skis, which Olson likened to attempting to ride a pencil, can send even experience riders flying into the water in a heartbeat. But the element of riding the line between chaos and control, which Olson had become familiar with from years of motocross and snow skiing, transitioned perfectly to the stand-up Jet Ski. After the race in Sparks, Olson entered the JetJam at Camp Far West in California, and in the first of two motos, he topped Prodanovich. The victory over the world champion further emboldened Olson, and after finding some success at races over the summer, he decided to enter the world championships on Saturday, Oct. 7, at Lake Havasu, Ariz.
For the race, he had a high-performance engine built and placed into the hull of his 1992 Kawasaki ski. The dual-carburetor, modified 550 replaced the single-carburetor engine Olson originally had in the ski and increased its speed from around 42 mph up to roughly 50 mph. After some time practicing, Olson said he was feeling extremely confident heading into the world championships. But on the day before the qualifying races, Friday, Oct. 6, while practicing at Havasu’s Body Beach, disaster struck. The crank in the new engine overspun the bearing, said Olson, and cracked. Olson and his father had brought three backup engines to Havasu, though none as good as the one he was planning on racing with, and dropped a production Kawasaki engine into the race hull. Ultimately, the engine swap worked and Olson was able to make it to race day, though on a much less powerful ski. The course at Havasu would be challenging with fields of racers in the 20s, big waves from the amount of watercraft on the lake, and the occasional 4-foot rolling wake created by a 50-foot ferry boat. The course offered only a few occasions when riders could make a pass, according to Olson, which were in turns and where the course split in two, giving riders an option of two sections of equal length. The field of vintage jet ski riders would be among the largest of the world championship race categories, and required a qualifying round to get into moto one and moto two. The two motos are both contested by the fields of riders with the winner determined by combining the finishing places from the two races. After getting through the qualifying round, Olson took to the starting line of the first moto. He’d lead off the line, but the field’s more powerful skis caught him going into the first turn. He’d make up ground in the turns, and by choosing from constantly changing lines to keep his pump in clean water as much as possible. Olson managed a second-place finish in the first moto. His second moto race would be similar, with a quick start followed by Rob Flores, of Las Vegas, tracking him down by the first turn. Olson finished third in the second moto, for a second-place finish overall. “I was getting the jump in every moto, but my ski would run out of top end,” Olson said. “Once they got to 5,000 rpms they were flying by me. Flores won the world championship with wins in each moto. While disappointed in losing his engine the day before the race, Olson said he is more confident than ever after the results in the world championship. Next year, Olson said he plans on showing up with three complete race skis for the championships. If things continue to go well on the water and a sponsorship comes up, he said he’d be open to moving out of the vintage class onto one of the newer skis, which can reach speeds of 65-70 mph.